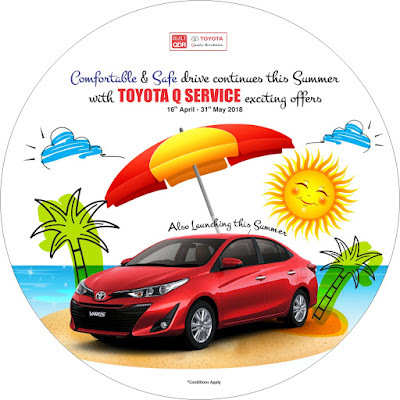 Toyota Kirloskar Motor (TKM) today rolled out its ‘Summer Campaign’ consisting of a wide array of exciting service initiatives, in line with the company’s consistent efforts towards enhancing customer delight. All Toyota owners across Karnataka, Andhra Pradesh and Telangana regions can avail free vehicle check-up for all Toyota models and more through the campaign period effective 16th April ’18 to 31st May 2018. This summer, Toyota is back with the seasonal campaign, sure to pamper the customers yet again by indulging them in a wide range of service offers that will make this hot season more fun-filled & enjoyable. Toyota globally having pioneered the “Customer First” approach, has timed this service campaign bonanza corresponding with the vacation season in India, to ensure customers gear-up their vehicles for a safe, comfortable and trouble-free drives during this summer. Speaking on the launch of Toyota’s Summer Campaign, N. Raja, Deputy Managing Director, Toyota Kirloskar Motor said, “ Customer First – being our key cornerstone, we remain dedicated to offer desired service support to our customers for the best care of their Toyota cars. We having assessed & understanding our customers’ needs, hence at the onset of every season, offer customized and attractive service packages that ensures the highest quality of maintenance and experience at every touch point. We hope this exclusive service campaign will add further delight to the experience of owning a Toyota vehicle. Being safety leader, it is our conscious effort to raise awareness on importance of regular maintenance of the cars to ensure safe driving experience. The dealers have also tasked themselves to reach out to customers and invite them for complete vehicle check, to ensure ‘NO MISS’ on the best deals before the summer drives. This exclusive service package of Toyota is sure to make their esteemed customers much happier, to hallmark its globally renowned Quality, Durability and Reliability [QDR] values.